Talor Gooch and Kelsey Cline. The team of professional Talor Gooch and amateur Kelsey Cline combined to shoot 8-under 133 and win the Oak Tree National Pro/Scratch Championship Thursday at Oak Tree National. The 36-hole event began with 18 holes Wednesday and concluded Thursday. Pro Kevin Tway, who last weekend in Columbus, Ohio., secured his PGA Tour card for 2016-17 with a second-place finish in a Web.com Tour playoff event, combined with amateur Mark Johnson to finish second at 134. Edmond native, Oklahoma State graduate and current Web.com Tour player Ian Davis joined with Karsten Majors to place third at 135. Former OSU great Trent Whitekiller and Tag Horner tied with Ryan O’Rear and Chase Chapman for fourth at 136. 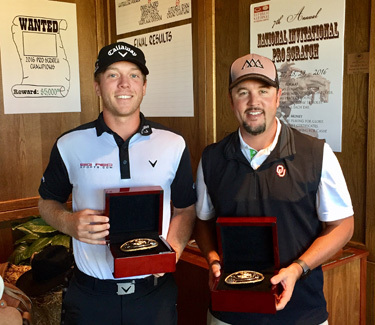 Rookie professional Michael Gellerman, formerly of the University of Oklahoma, and his partner Cooper Johnson were in a three-way tie for sixth at 137. Also shooting 4-under were the team of Bob Tway and Mickey Tettleton as well as the team of Scott Verplank and Oak Tree National co-owner Everett Dobson.